Sunset Beach is a small beach community located on Pacific Coast Hwy, between Seal Beach to the north, and Huntington Beach to the south. 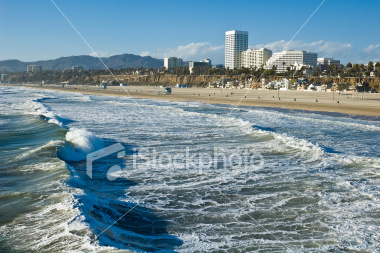 It is at the gateway to the major surfing beaches of Southern California. The beach at Sunset Beach is wide, open and generally uncrowded. 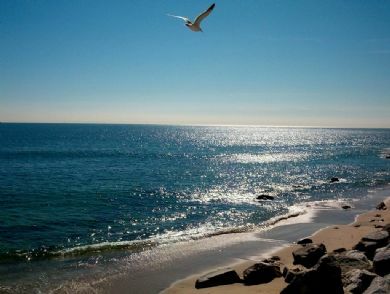 Santa Monica Beach iin LA county is an exposed beach break that has quite reliabel surf that can work at any time of the year. Offshore winds are from the northeast. Most of the surf here comes from groundswells and the optimum swell angle is from the west southwest. The beach breaks offers right-handers. Best around low tide. It's sometimes crowded here. I enjoyed surfing at both beaches.